Seven years ago, Spain was on the way to becoming a world leader in renewable energy, but after the election in late 2011 of a People’s party government seen by critics as hostile to the sector, there was little or no progress. While Spain has significant land and offshore shale gas and oil reserves, environmentalists and local authorities have blocked exploration, meaning renewables are Spain’s principal energy asset. 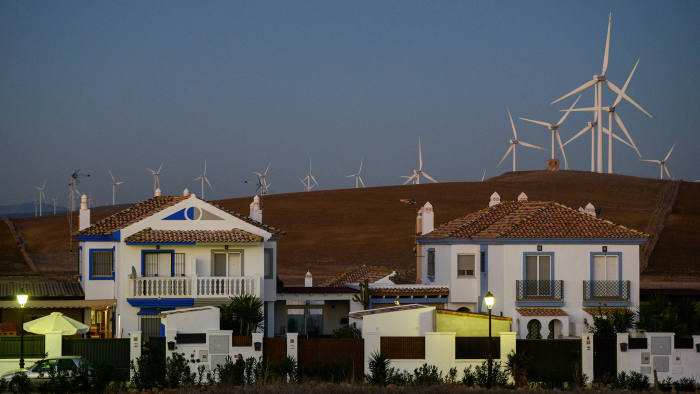 Since June, however, the new minority government, led by Pedro Sánchez of the centre-left PSOE, has asserted its commitment to renewable energy. One of its first acts was to go to Brussels to affirm its aim of again becoming one of Europe’s leaders in the field. The government made a commitment, confirmed last month, to remove the principal obstacle to developing solar power, the so-called sunshine tax, levied on those who generate their own electricity using photovoltaic technology. The government has also put the energy and environment ministries under one roof. 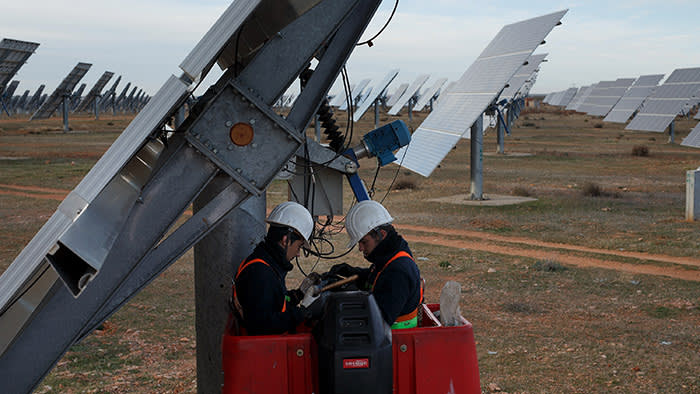 According to data from Red Eléctrica de España, which runs the Spanish grid, in 2017 renewables accounted for almost a third of energy generated for the national electricity system. The report, Renewable Energy in the Spanish Electricity System 2017, breaks down that number as follows: 18.2 per cent from wind, 7 per cent from hydroelectric, 5.2 per cent from voltaic and thermal solar, and 1.7 per cent from other renewables. The total renewable share was the lowest since 2009 and down from 38.4 per cent in 2016 after a fall in hydroelectric production, affected by drought. The main non-renewable sources were nuclear (21.2 per cent), coal (17.2 per cent), and a total of 24.9 per cent from combined cycle and cogeneration facilities, which are largely gas powered. Mr Ferrando points out that energy companies received subsidies to build wind farms in places where there was plenty of wind but not much demand. As a result, the regions with the highest renewable capacity are those with the lowest population. Although 80 per cent of the population and 75 per cent of electricity consumption is concentrated in the cities, Madrid and Barcelona have the least renewable capacity. Galicia, with a population of 2.7m, produces 7,152MW from renewables compared with the Madrid metropolitan area (6.6m people), with 231MW. For years energy companies have had something of a sweetheart deal with governments, while there has also been a “revolving door” with former ministers taking up senior posts in the sector and vice versa. This relationship is partly responsible for the tiny solar power generation in one of Europe’s sunniest countries, with Madrid enjoying almost twice as many hours of sun a year as Berlin. “It’s absurd that Germany produces 10 times more solar energy than Spain,” Mr Ferrando says. Most countries allow homeowners to sell on excess power generated by their solar panels to offset the cost of installation. In Spain, the power companies persuaded the government to introduce the “sunshine tax”, by which individuals were taxed on the electricity they generated, even if it was for their own use. As a result, solar panel installation came to a standstill, costing thousands of jobs. Solar is now to get a boost, however, says Fernando Prieto of the Sustainability Observatory, a research organisation. Besides the end of the sunshine tax, he notes, the EU is dropping tariffs on cheap, high-quality panels from China. According to the International Renewable Energy Agency, the cost of solar power generation has fallen 73 per cent since 2010. Mr Prieto estimates that between them, solar, wind and biomass could create 150,000 jobs by 2025. Hanno Schoklitsch, chief executive of Kaiserwetter, a German company that specialises in managing renewable energy assets, said soon after Mr Sánchez’s election that “Spain is now Europe’s most attractive renewable market”. He forecast there would be an investment of €80bn-€100bn in the industry between now and 2030. The Foundation for Renewable Energy is calling on the government to make 500,000 buildings a year energy efficient, creating jobs in a country where unemployment is 15.3 per cent. It says a target of producing 80 per cent of electricity from renewables would be relatively easy to achieve, having hit a high of 62.7 per cent in March. This was written by Stephen Burgen for Financial Times. To see the original version of this article, please click HERE.